As religious activists railed against a US-made anti-Islam film, Naveed Haider’s print works went into overdrive, running off hundreds of US flags for angry protesters to burn at demonstrations. Weeks of protests in Pakistan over the crudely made “Innocence of Muslims” have killed more than 20 people and caused serious damage to major cities, but for Haider business is booming. When the mobilisation against the US film began, “I knew the tills would start ringing”, said the manager at Panaflex printers, housed in a dilapidated building in Rawalpindi. The boom in the flag market has accompanied a surge in anti-American feeling in Pakistan, which has been battered and bruised by Taliban violence and US drone strikes since joining Washington’s “war on terror” in late 2001. So much so that the United States has replaced traditional rival India as enemy number one in public opinion — at least according to the flag-sellers. 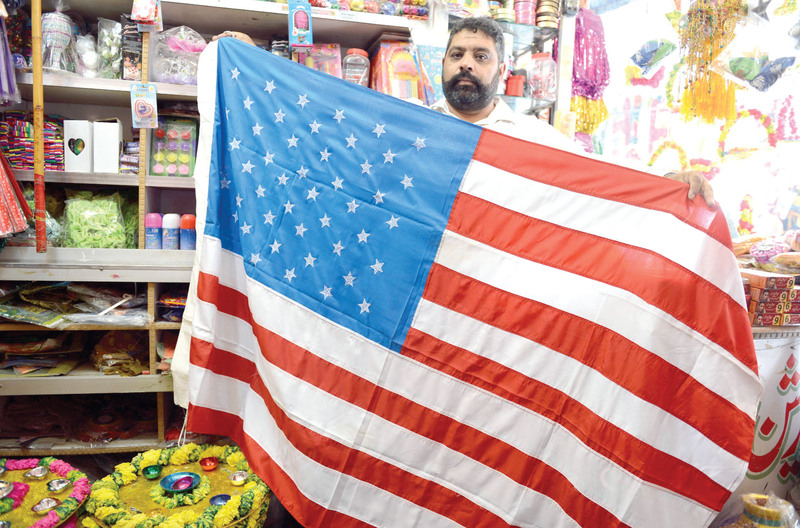 “It’s been a long time since I sold an Indian flag,” said shopkeeper Nadeem Mahmood Shah as people piled into his Rawalpindi store to stock up on American flags, as a few tattered old samples fluttered outside. In Shah’s shop 1,500 rupees will get you a three-square-metre Stars and Stripes in cloth, with a guarantee it will catch light with no problems — a key concern for protesters, particularly with TV cameras around. For Asim, a waiter in a seafood restaurant, burning the US flag has become a vital part of any protest. He has set four alight in a month. Protests against the film have led to more than 50 deaths across the Muslim world since the first demonstrations erupted on September 11. Pakistan experienced the worst of the violence when nationwide rallies mobilised more than 45,000 in September. At least 21 people were killed and 229 wounded, mainly in clashes with police. Last month, Railways Minister Ghulam Ahmed Bilour placed a $100,000 bounty on the head of the filmmaker, calling on the Taliban and Al-Qaeda to join the hunt and help accomplish the “noble deed”. Most young flag-burners are attached to political or religious groups. Jamaat-e-Islami, one of the country’s largest religious parties, actually provides its members with American and Israeli flags “so they can voice their anger”, explained Sajjad Abbas, a party official in Islamabad. “We have arrangements with printers and we supply them with the cloth,” he said. A well-drilled setup like this enables political groups to make their statement as cheaply as possible and to quickly exploit even the smallest spike in tension with the United States. “They end up costing us 50-60 rupees each,” said Asif Khurshid, one of the group’s officials in Islamabad. The Majlis-e-Wahadatul Muslimeen, a Shia party active in recent protests, utilises its student wing to organise the flags with partner printers. “We turn out 500 an hour,” boasted Mazhar Shigri, group spokesman in Lahore. The group’s “flag cell” is now preparing a major publicity stunt: a US flag 500 metres long and 60 wide, which will be laid out in October in a busy street, for the ultimate Muslim insult of being trodden under foot.